The gig was the anniversary of their 1969 tribute gig to the late Brian Jones, who had died only a couple of days before. They are also celebrating 50 years on the road. 50! I remember seeing those documentaries where Mick didn’t even give the band many years to live and some of his interviews where he was asked how long for he was going to be doing this. Well, it’s their 50th anniversary, ladies and gents! OK. So, many people might say that they will not really be as good as before, or even, that they did not sound well. They sounded so well. Granted that that their impact might’ve even been more powerful on a closed venue. But, even so that was one of the bits that you could hear the most from the audience, ie, their songs sounded well, that they were powerful, etc. I think it is even more significant when you hear that coming from some of the hipsters there who were probably more interested in The Temper Trap (which were quite good too). 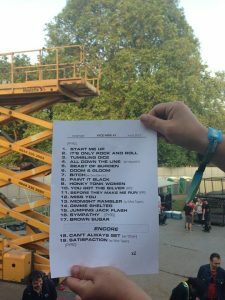 This was the setlist for that day. The band has evolved from those early years, and so their repertoire is vast, as it is the amount of artists they have worked with. At the gig, they had Mick Taylor (where was Bill Wyman?) playing Midnight Rambler. Lisa Fischer as the backing vocals for Gimme Shelter and Tumbling Dice was, shall I say magic? I can’t even find the right words to describe it. I’d heard Florence Welch ruining Gimme Shelter, and wasn’t particularly happy about it. Glad I didn’t have to pay to see that. So, my expectations were exceeded. Oh, and Gary Clark Jr and The Boxer Rebellion are people to watch too, especially Gary Clark Jr, who also played with the Stones. By the way, big kudos to their marketing team. I didn’t manage to get a decent video during the gig. So, hopefully the following video will serve as an example of what I lived. These days, when we can’t actually tell who is the greatest rock’n’roll band, they have managed to retain an enormous amount of prestige. See what I mean. This is the Stones thanking fans. Please come back again! Pleased to meet you, guys. Thanks for reading my post. See you soon! Seeing the Rolling Stones, no matter how old they are, is a historical event for anyone. I saw them a few years ago and had the time of my life. Good for you! There were so many bad critics – their age, their looks, musically not as good as before. But honestly, how many people can say that they are still playing long arena tours?